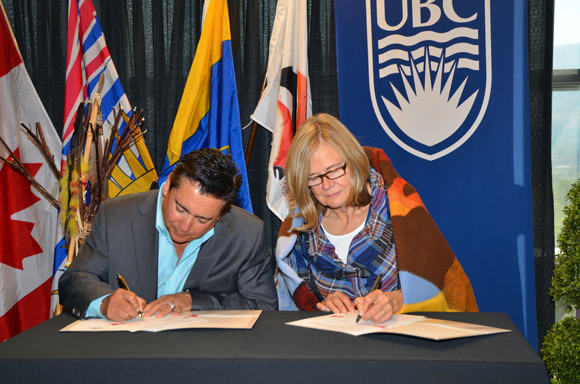 Westbank First Nation Chief Robert Louie and Deborah Buszard, Deputy Vice-Chancellor and Principal of UBC's Okanagan campus, sign a memorandum of understanding between the Okanagan Nation Alliance and UBC on Friday morning. The Okanagan Nation Alliance (ONA) and its member communities have renewed a memorandum of understanding with UBC’s Okanagan campus. Since welcoming UBC to its territorial lands when the campus was created in 2005, the Okanagan Nation has established a long-term relationship with the university. The understanding with UBC underlines the importance, opportunities and benefits of higher education for Indigenous People of the Southern Interior. ONA Chair Stewart Phillip, Grand Chief of the Union of B.C. Indian Chiefs, says the bonds developed with UBC are very important to the Okanagan people. “The renewal of the MOU continues to embrace the spirit and intent of the original signing which values distinct cultures, languages, territory, life-long excellence in learning and respect for Indigenous Peoples and their lands," says Grand Chief Phillip. Deborah Buszard, Deputy Vice-Chancellor and Principal of UBC's Okanagan campus, says the Okanagan people, their traditions, culture and future are essential to the university. “We are honoured that UBC has been welcomed into the traditional territory of the Okanagan Nation, and are thankful that we have been so warmly embraced by the Aboriginal community,” says Buszard. The agreement between the Okanagan Nation Alliance and UBC was signed on Friday, Sept. 28 in the Aboriginal Student Centre at UBC’s Okanagan campus.